NIAMH MCCARTHY BROUGHT the curtain down on Ireland’s display at the World Par-Athletics European Championships in fine style, securing the county’s sixth gold medal with a brilliant performance in the women’s F41 discus. The Cork native twice improved the current European record on Sunday with a personal best of 31.76 metres in Berlin, with her throw ten metres better than Poland’s Renata Sliwinska, who finished in second place. The Rio Paralympics silver-medalist’s display wraps up an impressive nine-medal haul for Ireland at this year’s European Championships. 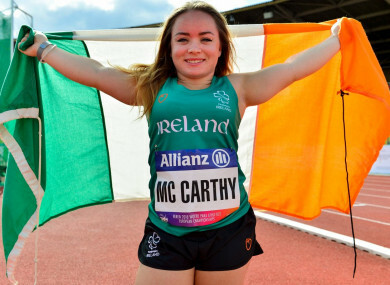 McCarthy was the final Irish athlete to compete, with her gold medal adding to further gold from Noelle Lenihan, Greta Streimikyte, Orla Barry, Jason Smyth, on top of double-bronze from Orla Comerford and another bronze from Jordan Lee. Email “Cork's Niamh McCarthy smashes European discus record to secure Ireland's sixth gold medal in Berlin”. Feedback on “Cork's Niamh McCarthy smashes European discus record to secure Ireland's sixth gold medal in Berlin”.